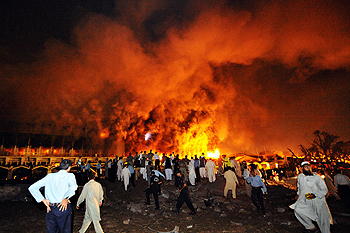 A suicide bomb attack on the Marriott Hotel in Islamabad left at least 50 people dead and injured more than 260 in Sept. 2008. Though Pakistan's links with terrorism have been disclosed many times, facts keep coming that strengthen this truth. Recently an American report claimed that Pakistan's intelligence service, the ISI, has secret links with the Taliban. This report has come when the United States is providing both money and arms to Pakistan to counter and defeat the Taliban. In this context we can remember those charges of India that Pakistan uses the military and monetary support received from the United States against India. Though this sensational report has been rejected by Pakistan, the makers of the report have again asserted that they have not one but many proofs. Recently, the government of Punjab, a province of Pakistan, presented its budget in which 0.82 million rupees have been declared for the banned organization Jamaat-Ud-Daawah. Hafiz Mohammad Saeed, the main conspirator of the Mumbai attacks of 26/11, is an international terrorist who is freely moving and publicly abusing the United States and India in Pakistan. The same Hafiz Saeed earlier established the terrorist organisation Lashkar-e-Taiba (LeT). When it became excessively notorious, then Saeed put up the label of social organization on it, and in this way in 2001 he became head of the newly self-created organization Jamaat-Ud-Daawah. Meanwhile, LeT was banned under international pressure. The lone caught terrorist of the 26/11 Mumbai attacks, Ajmal Kasab, himself admitted in special court in Mumbai that the 26/11 attack was conspired in Pakistan and that 20 people including Hafiz Saeed and Zaki-Ur-Rahman Lakhvi were involved. Indian court also in its verdict mentioned the name of Hafiz Saeed as a conspirator of the Mumbai attacks. A Red Corner notice was also issued against Saeed by Interpol in August 2009 in relation to 26/11 attacks. Consequently he was house-arrested in December 2008. But on June 2, 2009, the Lahore High Court freed Saeed, saying there is no proof of his and Lakhvi's involvement in 26/11. Many more things are noticeable regarding Hafiz Saeed. His image of "cleric" has made him popular among the illiterate masses of Punjab province. This also restricts Pak government to act against him. Secondly, Saeed has the "umbrella" protection of hundreds of trained militants. Therefore it is not easy to arrest him as a terrorist. Moreover, Pakistan has been using Saeed to achieve its ends in Kashmir. In these circumstances, if Pakistan wants to arrest him or take strict action against him, then Saeed can disclose many such truths that can create problems for the Pak government, Pak Army and the ISI. It's obvious that Pakistan would not allow this to happen. By the above situation, it should be clear why money is being allotted to Jamaat-Ud-Daawah from the Punjab government budget. Its supporters say that the United Nations or the United States has no right to ban any organization active in Pakistan. According to them, banning of any organization in Pakistan requires a specific notification by the Pakistan government, whereas no such notification has been issued by the government vis-a-vis Jamaat-Ud-Daawah. Therefore Jamaat-Ud-Daawah cannot be a banned organization. It is clear by this defensive claim by Pak officials that it is concerned neither by the confession of Kasab, nor by the verdict of the Indian court, nor by any kind of pressure from India, the United States and the United Nations. Rather, current circumstances are telling that the Pak government, Army and ISI themselves are concerned as to how to protect Jamaat-Ud-Daawah so that in the future it can help them in their anti-India operations in Kashmir. It seems contradictory that the Pak government and Lahore High Court don't treat Saeed as an accused for 26/11 while Indian court considers him a culprit and the Indian government has also given enough proof of his involvement to the Pak government. Notwithstanding all this, Saeed is publicly saying in Pakistani cities that one 26/11 is not sufficient for India. On what basis is he openly threatening India? Recently, Jamaat-Ud-Daawah organized an anti-Israel protest on main roads of Pakistan. In this, the extremist leaders of Daawah were seen crushing the flags of India, the United States and Israel. Saeed also participated in this rally. Pak government didn't take any action against this. Anti-India rhetoric and firebrand speeches are common in Pakistan nowadays. As things stand, it is difficult to expect something substantial from peace talks and attempts to normalize relations. As far as the control of terrorism by Pakistan through U.S. support is concerned, the American report and the provision of money for Jamaat-Ud-Daawah in the budget of Punjab have proved that Pakistan and terrorism are synonymous with each other. Since this terrorism was born, nurtured and protected in Pakistan, it becomes the duty of Pakistan to act against it. But the intentions of the Pak government and ground situation in Pakistan are repeatedly indicating that we cannot expect much from Pakistan as far as catching hold of terrorism is concerned. Tanveer Jafri is a columnist based in India who has been published in dozens of newspapers and portals in India and abroad. Jafri is also a devoted social activist for world peace, unity, integrity and global brotherhood. He is the recipient of awards in the field of communal harmony and other social activities.